At a ceremony celebrating the Fischell Department of Bioengineering's new partnership with Canon U.S. Life Sciences (CUSLS), CUSLS founder and senior fellow Hiroshi Inoue was inducted into the faculty as a Professor of the Practice. Left to right: past National Science Foundation director, National Academy of Sciences member, and Distinguished University Professor Rita Colwell; University of Maryland president Wallace Loh; Hiroshi Inoue; BioE Professor and Chair William E. Bentley; and Canon U.S.A. president and CEO Yoroku Adachi. Photo by John T. Consoli. The Fischell Department of Bioengineering (BioE) and the A. James Clark School of Engineering are pleased to welcome Hiroshi Inoue to its faculty as a Professor of the Practice. 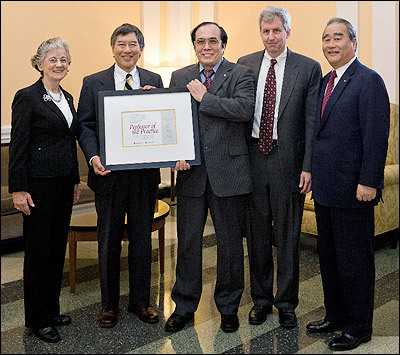 Inoue was inducted in a recent ceremony attended by Canon U.S.A. president and CEO Yoroku Adachi; BioE professor and Chair William E. Bentley; past National Science Foundation director, National Academy of Sciences member, and Distinguished University Professor Rita Colwell; and University of Maryland president Wallace Loh. The event also celebrated the department's new collaboration with Canon. Inoue, founder and senior fellow of Canon U.S. Life Sciences, Inc., is a key member of that new partnership. He will be leading a team including Bentley and BioE professors Keith Herold and Ian White on the development of a new system capable of providing fast, automated diagnoses of diseases. At the core of the new device are Canon U.S. Life Sciences’ proprietary genetic analysis system and a new microfluidic chip-based disposable testing cartridge for human blood samples. The project's ultimate goal is to provide doctors and clinics with sophisticated molecular analysis tools capable of providing "bedside diagnostics" that will eliminate the need to wait days or even weeks for lab results. "I am honored and humbled by my appointment at University of Maryland as Professor of the Practice," says Inoue. "I expect that it will provide a powerful linkage between the Global Canon Group and the University of Maryland. We already have an exciting collaboration with the Fischell Department of Bioengineering and I look forward to an ongoing relationship." During his nearly 35-year career, Inoue, a graduate of the Engineering Science School at Osaka University, Japan, has pioneered numerous and diverse technologies while working for some of the world's most prominent companies, including Seiko, Epson, Ricoh, and, since 1983, Canon. These include the development, market introduction and market expansion of novel flat-panel displays; the introduction of the ISO/IEC Standard into the MPEG-4 file format, which enables users to view video on smartphones; and genetic diagnostics systems. In 2004, he launched and served as the first president and Chief Technology Officer of Canon U.S. Life Sciences, Inc., which is dedicated to the development of diagnostic instrumentation based on Canon's core technologies. In 2010 he was appointed Senior Fellow of Canon U.S.A. and Canon U.S. Life Sciences. Inoue holds almost 350 patents in Japan and the United States. "We are honored to welcome Mr. Inoue to our faculty," says BioE professor and chair William E. Bentley. "His accomplishments and experience embody Dr. Fischell's vision, and our department's goals, of using entrepreneurship to move innovative new devices from the lab into clinical settings, where they can be used to improve the lives of millions of people around the world."